Will RoofMills do a Months Worth of Electric in One Hour? >> times what I need. Is that right? No because it is not sunny at night and it is not windy all day every day. AND it is not usually sunny when it is most windy. You are calculating on unrealistic weather and wind/sun resources. This system will be more like 50 to 75% of your electric bill most likely. But we have to consider all the variable factors to see how good it might do on your site. >> in just one hour? No, you are confusing a kilowatt KW, with a kilowatt hour kwH. 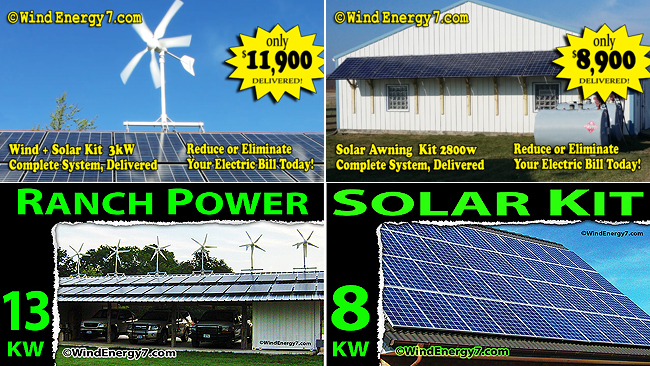 The system has a max potential of 6200 watts, that's 6.2KW kilowatts. If it ran at FULL CAPACITY for an hour, that would be 6.2kwH.. 6.2kw for an hour is 6.2kwh kilowatt hours. you have kilowatts = a thousand watts, then kilowatt HOURS = 1000 watts sustained for an hour of time. The kwH kilowatt Hour is how we buy elerctric. The kilowatt is more an expression of potential of a device to use or produce power.